After Oprah Winfrey lured away Cal-a-Vie chef Rosie Daley more than 15 years ago to become her private chef, Steve Pernetti arrived on the scene. Since then, the executive chef of this Vista, California, destination spa has been impressing guests with dazzling delectables that not only look artful but enthrall the taste buds—a not-so-easy feat, given the requirement to keep calories and portions in perspective. Terri and John Havens, the New Orleans entrepreneurs who purchased Cal-a-Vie after visiting the health resort in 1998, felt the time was right for a new cookbook featuring the creations of Pernetti’s all-star culinary team—which includes sous chef Jason Graham—one that would serve as an “at home” extension of the menus that guests benefit from while staying at Cal-a-Vie. The 141 gourmet yet simple recipes culled for this collection reflect Cal-a-Vie’s mission to provide an energizing dietary program that adheres to the guidelines of a low-fat, low-sodium, high-fiber regimen that is plentiful in natural complex carbohydrates (legumes, whole grains, fresh fruits and vegetables), limited amounts of lean animal proteins (egg whites, fish, poultry and dairy products) and minimal amounts of natural cold-pressed oils (such as almond and olive oils). Throughout this highly nutritional journey on the path to eating well, flavor and satisfaction are not sacrificed. Helpful menu suggestions throughout the book offer balanced meal planning and include everything from beverage ideas to hors d’oeuvres. Breakfast recipes cover a spectrum of diverse choices, such as Lourdes’ Huevos Rancheros, a spicy southwestern egg dish with low-fat cheese on a tortilla served with a spot of Cal-a-Vie’s own tasty version of fresh guacamole, and Praline Pancakes, laced with cinnamon and toasted pecans, drizzled with warm syrup and garnished with fresh fruit and confectioners’ sugar. An array of meals and accompaniments ensure that diners get to choose from a variety of sumptuous foods adapted from many cultural influences while adhering to a spa-diet regimen. Seafood selections include the Asian-inspired Hoisin-Crusted Mahi Mahi and the Shrimp Stack, a colorful, fancy mold piled with large shrimp, avocado, fresh fruits and balanced with flavors of jalapeño and cilantro. Featured poultry sources are crunchy Macadamia-Crusted Chicken and Barbecued Chicken Pizza, a tangy, crispy, thin-crusted delight. Other recipes run the gamut from Turkey Basil Meatballs, Spinach Salad With Strawberries and Goat Cheese, Wasabi Mashed Potatoes, Roasted Mushrooms and Rigatoni alla Bolognese. 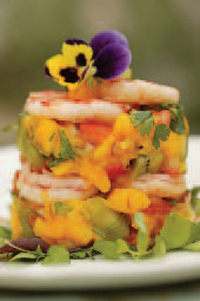 The recipe for Cal-a-Vie’s Revitalizer, a favorite beverage of guests’, is included in the book. Served hot or cold, this rejuvenating concoction consists of low-sodium tomato-juice cocktail blended with assorted sliced vegetables and fresh herbs. Fruit-infused teas and smoothies are also highlighted. Snacks ideas are provided as well, including the habit-forming Gorgonzola Cheese Gougères, bite-size bits of pure satisfaction, and Creole Crab Cakes, a trimmed-down, tasty nod to Louisiana cooking. 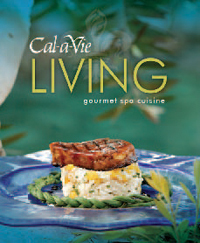 Fans of the sweet stuff will rejoice in knowing that Cal-a-Vie Living, Gourmet Spa Cuisine includes recipes for desserts, a welcome surprise coming from a place dubbed one of the best spas for weight watchers by The Wall Street Journal. Guests of Cal-a-Vie absolutely adore indulging in the Chocolate Fondue served with apples, mangoes, bananas or strawberries. Refreshing Piña Colada Sorbet is rife with the tropical tastes of pineapple, coconut milk and rum. In addition to supplying readers with enticing, nutritious recipes, this gorgeous, hard-bound, full-color cookbook easily doubles as coffee table eye candy. The splendid photography that springs from the pages captures not only nourishing food at its most luscious peak, but the lush, verdant Provençal-inspired grounds and the cozy, luxurious interiors that compose the restorative sanctuary that is Cal-a-Vie. Those who are intrigued should take a break and soak in an herbal bath at home, don their fluffiest white cotton robes and then get in their kitchens and try this fantastically wholesome and exciting spa cuisine; it’ll be the next best thing to visiting Cal-a-Vie! 1) Preheat the oven to 425 degrees. Melt the butter with the water in a saucepan over low heat. Bring to a boil and add the flour all at once, stirring until the mixture forms a dough. Remove from the heat and let cool. 2) Beat in the egg and egg whites one at a time. Fold in the cheese. Spoon into a pastry tube and pipe into 1-inch mounds on a parchment-lined baking sheet. Bake for 5 to 10 minutes or until puffed but not yet beginning to brown. Reduce the temperature to 350 degrees and bake for 10 minutes longer or until crisp and golden brown. 1) Cut the shrimp into halves and combine with the avocados, tomatoes, mango, scallions and jalapeño chile in a medium bowl. Add the cilantro and lemon juice; season with salt and pepper and toss to mix well. 2) Pack the mixture into molds or plastic cups and chill in the refrigerator. Invert onto serving plates and garnish with cilantro sprigs. Serve with large croutons. 3) You may add tabouli or legumes to the stack for added carbohydrates; alternative protein sources work just as well. 4) You may add chopped, peeled kiwi fruit to the stack if desired. 1) Combine the Kahlúa, milk, honey, baking cocoa, arrowroot and vanilla in a saucepan and mix well. Cook over medium-low heat until thickened and smooth, stirring constantly.